While we’re counting down the weeks to our next PADI Instructor Development Course in November, our recent IDC graduates are getting busy with the business of scuba diving. Our September IDC candidates, who are now qualified PADI OWSIs, are continuing their pro internships and wielding it to gain lots of experience here in Sabah, Borneo. Yesterday our interns were knee deep in the business of scuba diving, because our PADI IDC Dive Centre on Gaya island was humming with students eager to learn how to dive. Under the ever-watchful eye of Downbelow’s resident PADI Course Director, Richard Swann, our pro interns busied themselves in all corners of the dive centre. In one corner Sam had just completed teaching his first PADI Rescue Course, whilst in another Oliver was wrapping up teaching his first PADI Open Water Scuba Diver course. 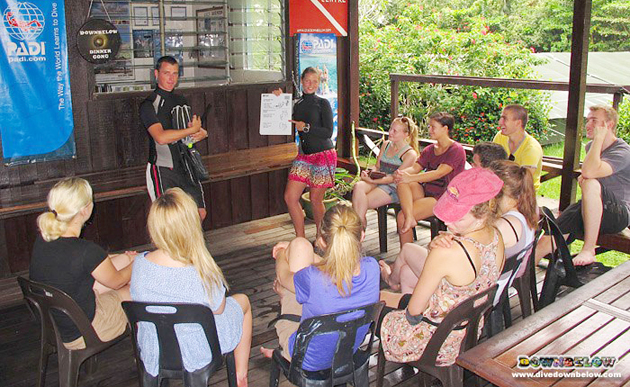 One of our local interns, Matius, was also spotted giving his first fun-diving briefing as a Divemaster trainee. And, surrounded by a group of 10 keen-looking students, were Wouter and Nena, starting day 1 of a group open water course. The group is the next batch of our European adventurers who join us for a month of action in Sabah, Borneo. There’s plenty more action to come over the next few days and we look forward to seeing more of our Instructors’ professional skill being used in practice. Sign up now for our November PADI Instructor Development Course in Sabah, Borneo and you too can benefit from Downbelow’s professional internships. Email us now or contact us to take the next step in your diving career – Go Pro with Downbelow.